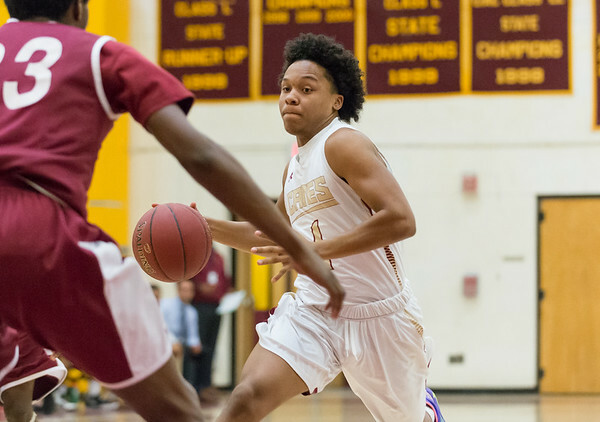 NEW BRITAIN - Back on Jan. 8, New Britain junior Tahmeen Dupree stated that the boys basketball team’s defense, which had just forced 27 turnovers in a 50-point rout of Rocky Hill, still had room to grow. Considering the Hurricanes had just stifled the Terriers from the opening tip to the final whistle, while scoring 12 of their first 17 points off turnovers, Dupree’s declaration seemed difficult to imagine. After narrowly missing 30 takeaways in a single game en route to a season-high 91 points, did the New Britain defense really have much room to improve? Well, after the Hurricanes’ 93-52 victory against Bulkeley on Monday night, it appears Dupree may have been on to something. Turns out, New Britain could improve upon its already stifling defense, and the team seems to be peaking at just the right time. After clinching a spot in the state tournament with a dominating 58-27 win over Plainville on Thursday night, the Hurricanes set a new season-high with 93 points against the Bulldogs at home, securing the team’s fourth-straight victory. New Britain also forced 23 turnovers, five of them coming within a four-minute span during a decisive 16-4 run late in the first quarter, as the team continues to break through its supposed ceiling and somehow look better with each passing contest. There was no sense of “me” anywhere in New Britain’s win on Monday, when 11 different players recorded a point and six finished in double figures. “We’re definitely playing unselfish basketball and just working hard and wanting it more,” senior Maurice Turner said. With less than a month remaining in the regular season and a tournament berth already decided, the Hurricanes have shown no signs of slowing down, instead picking up more speed with each passing win. Over the team’s current winning streak, New Britain has beaten opponents by an average of 22.3 points per game. Its average over the first two games of that span, the average margin of victory was 8.5 points. Over the past two, it’s skyrocketed to 36 points per game. While the ultimate goal is important, the Hurricanes have managed to consistently improve upon their prolific defense by keeping the focus on improving on a game-by-game basis, which the team hopes to continue through the end of the regular season and the state tournament. By not looking ahead, the Hurricanes have left their spectators hopeful for some late season success, especially if the team continues its current trend of improving upon areas of its game that already appeared to be thriving. If New Britain is reaching its full potential, it’s come at an optimal time. Posted in New Britain Herald, New Britain on Tuesday, 29 January 2019 21:29. Updated: Tuesday, 29 January 2019 21:32.